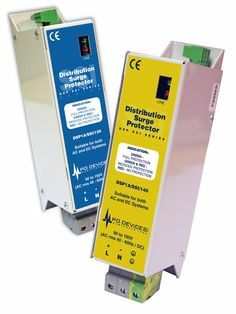 RTM surge protection devices provide protection to equipment connected to AC power supplies against the damaging effects of lightning strikes or voltage surges. The RTM Series offers single phase devices with MOV or SAD component technology, which help reduce the failure rate of Trackside Functional Modules (TFMs) during lightning storms, and therefore can improve Solid State Interlock (SSI) performance and prolong the service life of protected equipment. They are employed on the incoming power supplies or tail cables, providing protection of the 110V, 140V and 650V power supplies in the SSI equipment cases and rooms. These highly innovative protection devices provide the ideal protection solution for signals, points, level crossings etc. at each, and in between, every station. The RTM Series feature high surge current handling capabilities which operates in two stages to ensure continuity of transient suppression. Under normal conditions the RTM will automatically reset after clamping smaller, more commonly occurring surges, and two green lights indicate that full protection is present. However, should a surge current in excess of 75kA or 12kA (depending on the model selected), appear on the line, it will be clamped by the RTM, but the first protection stage may possibly suffer damage and fail safe. In this instance, one green light from the damaged RTM module will be extinguished and although the system will still be protected, the unit should be replaced before a further large surge can remove the second stage. There is no protection present when the RTM modules lights are not illuminated, although unprotected power is still supplied. The RTM is fitted with a remote signalling facility, where volt free terminals (which can be connected as either normally open or normally closed), open or close when the first protection stage is lost (one green light on) and these can be used to activate a remote indicator such as a lamp or alarm. The switching contacts are completely isolated from the supply and may be used for AC mains voltage 230V RMS 1 Amp or 30V DC 2 Amp loads. Fusing - The RTM Series is suitable for direct connection to a line rated up to 100A with 16mm² min connecting cables. However it should be remembered that if the unit were to see a surge in excess of its designed capability, then the main fuse would be ruptured and the supply disconnected. Provision of additional inline disconnecting fuses to the RTM will overcome the above and also provide isolation for maintenance and exchange. Units can be connected to a supply of greater than 100A providing inline fuses rated 50A min - 100A max (BS HD60269-2:2010, BS88-2:2010) are fitted. In order to discriminate with the supply fuse, the inline fuse should be in the ratio of 1:2. The inline fuses can be replaced by MCBs providing they are type C.
Maintenance - The RTM Series requires no maintenance, but the lights and condition of connecting cables and terminations should be checked regularly, particularly following lightning activity, to ensure full protection is present. The remote signalling facility is ideal where units are fitted in infrequently inspected housings. Component Technology - The RTM series of surge protection devices provides protection of critical assets through carefully matched high energy absorbing elements. SAD Surge Protection Modules - Silicon avalanche diode (SAD) models conduct maximum current without any increase in clamping voltage. They offer extremely low clamping of <500 volts and an exceptionally fast response time of less than <5 nanoseconds. The robust nature of this component technology offers long product life expectancy, ideally suited for mission critical applications. MOV Surge Protection Modules - Metal oxide varistor (MOV) models provide excellent clamping of transients within <10 nanoseconds and are ideally suited for high/medium/low risk applications. Cost of surge protection devices far outweighs safety issues, downtime and equipment replacement.